Auditing is a Business Management Process which helps an organization ensure compliance to operational requirements and to determine the efficiency and overall health of an organisation. 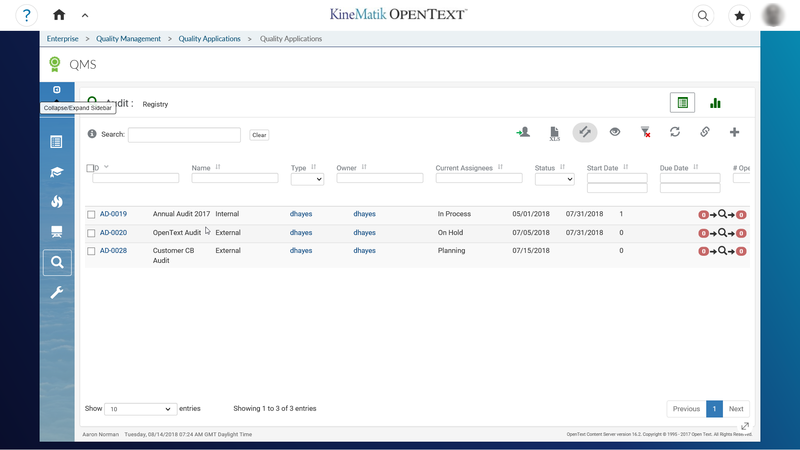 The Audits Application is an Audit Management application for OpenText xECM which standardizes audit strategies, enhances audit activities and provides real-time visibility to the audit team in a workflow driven environment. An automated Audit process speeds up the process of audit preparation, scheduling, conducting the audit and reporting on audit activities. Establish an automated, documented Audit procedure which is central to an organization’s Quality Management System to ensure the health and efficiency of the operation. Manage, track and integrate all Audits related records in a single system. Integrate the Audit System with other Quality applications to gain better visibility and control into quality processes.